The true cost of learning the piano is…(drum roll)…are you ready for this? You’ll be amazed. The true cost of learning the piano is $169.95!! How do I know this? It popped up while I was online. In fact I see this ad everywhere. It seems the internet gremlins know that I’m a piano enthusiast so I am constantly solicited by people selling piano stuff: on my Facebook page, in my email, everywhere. Everyday I see this ad! It says “Master the Piano in 4 Weeks”. * Really? 4 weeks? And it only costs $169.95. Sounds too good to be true. It is too good to be true. Trust me. Nobody is going to master the piano in four weeks, except maybe Eddie Morra (that guy in the movie “Limitless” who takes a pill that makes him into an instant genius). The rest of us are just going to learn to play the piano the old fashioned way, take lessons and practice, or in other words hard work and sacrifice. If you are considering enrolling your child piano lessons or if you are just getting started on the piano journey it’s good to have an idea of what you are getting into. There’s a lot of talk about the many benefits of music study, but what about the cost of learning the piano? What is entailed in the study of this great instrument? To begin with you will need a piano so that your child can practice at home. There is no way around this so give it some serious thought. A piano, unlike most other instruments, is large and and can be expensive. It’s definitely going to take up some real estate in your home. The choices are acoustic and digital (table top keyboards are not pianos and should not be used for serious piano study!). I prefer acoustic for many reasons. If you have never before purchased a piano get some help from your teacher, a piano technician or a pianist you trust. Ideally, you should secure an instrument before the first lesson. If you don’t have a piano you should absolutely have one within the first month of piano study. The cost of a piano varies greatly but you won’t get anything decent much for less than $1000. The cost of lessons is largely determined by the area in which you live and the level of education and experience of the teacher. I firmly against making price the number one factor in selecting a teacher. A teacher that works well with children with and has successful students is what you are looking for. It is also important that your teacher know how to play the piano well him/herself. Lessons will cost you between $1000 and $2000 per year. Most students will continue taking lessons until they graduate from High School. But be forewarned that learning to play the piano well takes many years. There are some other small monetary costs associated with piano lessons. The cost of books, materials and recital fees come to mind but these things are usually very inexpensive. 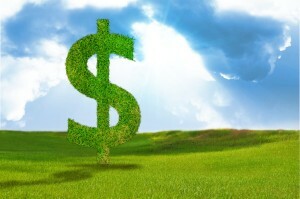 You can plan on between $100 and $200 per year for these things. That takes care of the monetary costs of piano lessons, but there are other things to consider. As I said earlier learning to play the piano well takes many years. Piano lessons are not a seasonal activity. Your child should take lessons and practice throughout the year. This is a big commitment for both you and your child. I advise my students against taking long breaks from the piano. Of course vacations are wonderful, but if my students are to be away for more than a few weeks I try to arrange it so they can continue learning, by finding a teacher near their location, online lessons with me or assigned practice materials. Speaking of practice, there’s no way around this one either. Your child has to practice everyday (or nearly everyday). 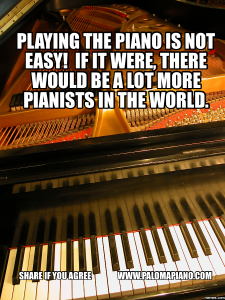 This is the most difficult aspect of piano learning. Everybody struggles with it, everybody! But it has to be done. It comes down to that fact that a 30 minute piano lesson once per week is not enough time on the keys to learn to play the piano. Since piano is such a (for lack of a better word) relentless undertaking there are bound to be ups and downs to deal with, but your teacher will help you get through these. Even my best students go through periods when they feel like giving up.Thankfully these periods are usually short-lived. 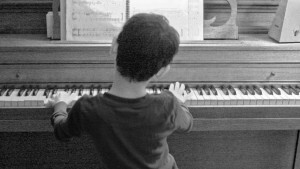 I hope this post didn’t scare you away form signing you child up for piano lessons.There are a many great reasons to have your child take up the piano. If you think about it piano lessons are probably the best value around when it comes to extra curricular activities. If for no other reason than that the piano is something your son/daughter can enjoy for a lifetime. Playing the piano is a whole lot of fun. I’m glad there’s no magic pill to take and learn to play the piano instantly. If it were easy everyone would play and then it wouldn’t be so special. I have not tried or reviewed all of the online piano methods. There probably are some good ones that work for older students or people who have previous experience with the piano. I am not in a position to say that none of them are any good. But I can pretty safely say that no one can master the piano in 4 weeks. If you like this blog subscribe. < Previous “Thanks, Mom and Dad” 10 Reasons Your Child is Thankful for Muisc Lessons.